As a society we are engaged in plenty of wailing and hand-wringing about the “problem” of “obesity” (which is to say that problem of people whose weight in pounds times 703 divided by their height in inches squared is greater than 30). This creates an environment of shame, stigma, bullying and oppression based on how people look. 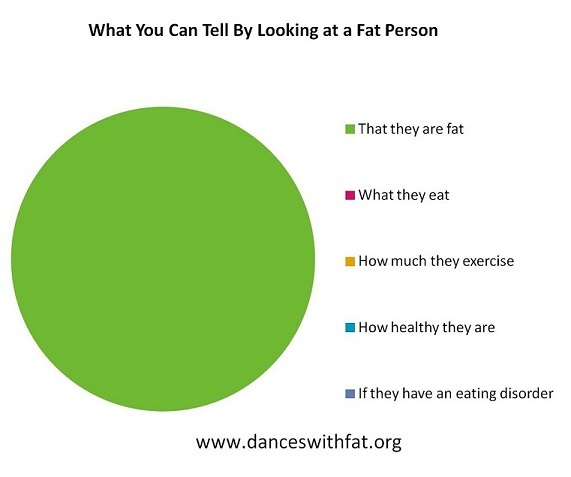 Also, the truth is that “obesity” is a body size – it’s not an eating disorder, it’s not a diagnosis. it’s not the problem. All of this flailing muppet arm won’tsomebodythinkofthefatpeople drama draws attention away from actual problems that we could be addressing. There is definitely a problem (several actually), but it’s not obesity. When you say that body size is the problem then you are telling people to have a problem with their bodies – betting that they will somehow hate themselves thin and healthy (which are two different things). Knowing what Dr. Muennig’s research found, and knowing that we live in a world where people spend their time making sure that we get a ceaseless stream of body hatred, it would make more sense if people of size did suffer more mental and physical illness. But if that’s the case then the issue is not obesity, it’s social stigma, and even if there was a single study where more than a tiny fraction of people succeeded at weight – thus giving us some reason to believe that it is successful, weight loss is not the cure for social stigma. Ending social stigma is the cure for social stigma. Like the stress of being constantly stigmatized by everyone from jerks on the internet to doctors perhaps? How about we give ending social stigma around body size a try? Couldn’t hurt, would probably help. Someone’s health, their prioritization of their health, and the path they choose to reach any health goals that they may choose are intensely personal and not a matter for public consumption. Health is not entirely within our control. Health is not a barometer for worthiness, it is not a societal obligation, it is not anybody’s business. Public health should be about providing health options to the public, not about making the individual’s health the public’s business. We’re spending so much time buying and selling thin, that we’ve forgotten about actual health. Sixty billion dollars went to the diet industry last year. Meanwhile, plenty of people don’t have access to the foods that they want to eat, or to safe (both physically and psychologically safe) movement options. Sixty billion dollars could have created 60,000 100 acre organic farms. It could have created 60,000 community centers with lots of movement options and sliding scale member fees. And that’s just in one year of diet spending. In order to “fight” the “problem” of people living in larger bodies, we gave sixty billion dollars to an industry with a less than 5% success rate that has been sued repeatedly by the US Trade Commission for deceptive trade practices and LOST EVERY TIME. Studies show us over and over that healthy habits, not weight, are the best predictor of future health. Health is multi-dimensional and not entirely within our control – it includes genetics, access, stress, past behaviors and current behaviors, and health is never guaranteed. Everybody is going to die and if you don’t get hit by a bus it’s pretty likely that things will go wrong with your body, and there is no magical “healthy weight” that will stop that from happening. Focusing on body size misleads people about health habits, leading fat people to believe that habits don’t support our health unless they make us thin, and telling thin people that they are healthy because of their size and regardless of their habits which is not what the research shows. It also gets in the way of the proper treatment of actual health issues in people of all sizes. Doctors neglect to do basic diagnostic tests on thin people because they assume that they are healthy, and people of size aren’t properly diagnosed because doctors are too busy giving a diagnosis of fat and a treatment protocol of weight loss. We can do better than this. There is nothing – NOTHING – that could possibly be achieved by a war on fat people that couldn’t be achieved by an initiative for providing access to healthy foods, enjoyable movement options and affordable evidence-based healthcare to those who want them, and the latter creates an environment where people of all sizes are treated with respect and given the opportunity to appreciate, like, even love their bodies. Next ›It’s the Swimsuit Post! I know how much healthier I have felt – somewhat physically and hugely emotionally – since I got off the diet treadmill. Now a salad is just a salad, not a crown of thorns. Now a bowl of ice cream is just a bowl of ice cream, not a one-way ticket to eternal damnation. Now when Mr. Twistie jiggles my tummy, it’s clear to me that it’s an expression of his affection and attraction for me rather than the warning/accusation I assumed it to be the first time he did it. Now I can whole-heartedly believe Mr. Twistie when he says I’m pretty. And while I know the plural of anecdote isn’t data, I can definitely say that my personal experience of turning off the hateful messages has definitely benefitted me in a huge way. Plus Mr. Twistie can express his attraction without fear of me bursting into tears or yelling at him or – the most common reaction – fall into a huge funk and not cook for two days, so he’s benefitted quite a bit, too. Genius! I’m totally using that one. And by using it, I mean I’m going to tell myself that when I find myself thinking I’m eating something “I’m not supposed to” eat. “A salad is just a salad, not a crown of thorns.” YES. Genius. I’m more willing to go to the doctor, emboldened by Ragen and this community, I deal with the issues I do have, and not with the one society says I do. Helps to get recommendations, of course. Ain’t that the truth! I have always been pretty self confident (at least in appearance) and assertive, but I would love to have a talk with teen and twenty-something me. I’d tell her that she deserves better. I’d tell her not to apologize for eating 5 apples after school if that’s what she wanted (fresh off the tree in the fall, lived on a farm). I’d tell her that she didn’t need to sneak ice cream–and have more than she really wanted because who knew when the chance would come again to eat it without someone judging. I’d tell her “good for you” when she told a date that “No, I really, really do want a salad for dinner. I’m not on a diet and I’m not being cheap.” She was embarassed about it but couldn’t quite put her finger on why. I’d tell her that she deserves better. She knew this, but I’d remind her that body types go in & out of fashion and there really would be a guy who was both good for her AND into her body just the way it was. I’d tell her to thank her mother and grandmother for telling her she was beautiful, and encourage her to believe them once in a while. She deserved it. And this from someone I think is a great cardiologist! After that, I was much more comforted by the fact that the EKG and ECG came out fine. Pretty sure neither of those machines took my weight into account. I’m sitting at my desk looking at a real health timebomb, and it’s not obesity, it’s old age. Statistically we are living longer, more people are living into extreme old age, the longer you live in your body the more likely it is that things will start to go wrong with it, and old people – who don’t stop being human beings at some predetermined age or with the onset of dementia – are getting short-changed when it comes to health and social care. Every penny that’s spend in the NHS on nagging or paying health care workers to bang on about obesity is a penny that’s not being spent where there is genuine need and where we could be doing things that would actually improve people’s quality of life. Ironically, many of the people who get flagged up by our computer systems as needing intervention for obesity are people with chronic health problems, to whom the Obesity Paradox applies. And many of these will be elderly people, because they are more likely to have at least one chronic health problem, even though the evidence stacks up heavily in favour of having a BMI in the overweight range when you’re older. The idea of an earnest young dietitian advising a portly 90-year-old to change their diet and lose weight for the good of their health would be comical if it wasn’t actually happening. Excellent point. That’s something that constantly gets lost in the morass of fat-shaming. A big chunk of why more people have diabetes, heart disease, etc. these days is that we’re not dying as young of diseases that have been eradicated; rather, we’re living long enough to become ill with chronic diseases. Sometimes I think this is an accident. Other times I think it’s a deliberate effort for thin people (medical professionals especially) to convince themselves there’s a way to stay safe from illness and death. Which there’s not. This life is going to get us all, one way or the other. Cheez whiz, what’s the matter with these old farts? Don’t they know if they just stayed young, there’d be nothing wrong with them?? I’ve worked with the elderly since 1988, and this is something I’ve said for years. The so called “diseases of obesity” are, in fact, diseases associated with aging. The older you get, the more likely you are to get one or more of them.